The fourth and perhaps the most crucial post on this complex but inglorious blot on Rotherham Borough Council’s reputation. Rotherham Politics provides the evidence of the sheer effrontery involved in this grubby little tale of an attempted sting perpetrated on our local NHS Trust by RMBC and should serve as an instructive example to everyone. Further to our recent correspondence (see previous attached documents) I am writing to thank you for your prompt, courteous and very comprehensive letter of 10 October (Your Ref: BJ/JF/2 – see copy attached). I also wish to place on public record my sincere appreciation for the volume of information which you have kindly given to me, and also to assure you that I in no way felt that you had misled me with your original letter dated 22 September (Your Ref: BJ/JF). As a Rotherham citizen, taxpayer and ratepayer I also fully support you and the Board of RDGH when you decided not to use money identified for supporting healthcare services at RDGH to in effect bankroll RMBC in the discharge of what are very clearly their responsibilities for the streets and areas which clearly fall outside of the campus of RDGH. 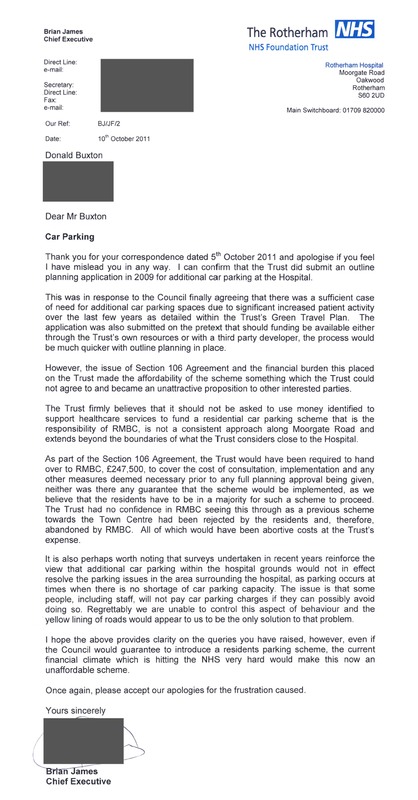 I must admit that I am appalled at the extent to which RMBC unsuccessfully tried to coerce RDGH into paying £247,500 for a Section 106 Agreement simply to facilitate the approval of RDGH’s well-balanced and patient-centred planning application which I am sure would have helped to improve the patient experience at RDGH. I am so glad that RDGH is headed up by such an astute healthcare professional as you, and supported by an equally effective Board and Senior Management Team. Frankly I think it is appalling that RMBC never ever considered that if their obnoxious ploy was successful in obtaining from RDGH the £247,500 of taxpayers’ financial health resource just how many hip, knee, cataract and cardiac bypass operations they were denying RDGH patients, and how many hours of special care baby nursing that sum would have provided to resource the maternity and special care baby unit. As an active and empowered citizen in the Wickersley/Bramley area I am now very much aware that RMBC have resorted to Section 106 tricks in the past in my locality, notably in Bramley, when RMBC demanded £10,000 from a property developer for the installation of a Zebra Crossing (as considered so necessary in a report by their own officers), as a condition of a planning permission to construct new housing on the old dairy site. Well the £10,000 was handed over to RMBC coffers, the planning permission granted, the demolition of the dairy undertaken and new housing built, however RMBC then back tracked on the implementation of the Zebra Crossing, and then insisted it was no longer necessary. But they kept the £10,000 and as a sop to the local community after five years of wrangling, simply installed two sections of lowered kerbs – no black and white markings, nor Belisha Beacons! I am of the opinion that it is entirely likely that if RDGH had fallen for RMBC’s crude attempt at demanding £247,500 from RDGH, then on past evidence all that would have happened is that in effect RDGH would have been bankrolling RMBC per se. I am extremely glad that you and the Board and Senior Management Team saw fit to reject RMBC’s objectionable trick. I intend to ask my Elected Ward Councillor, Sue Ellis, to take up the above matter within the Council so that those Elected Members on the Health and Wellbeing Board may become better acquainted with the activities of their colleagues in the RMBC Planning Department. This entry was posted in Greedy Councillors, Greedy Piggies, Political Dirty Tricks, RMBC, Rotherham Metropolitan Borough Council and tagged Council Profligacy, Gerald Smith, Ken Wyatt, Labour, Labour Chicanery, Labour Party, RMBC, Roger Stone, Scum Labour by Rik. Bookmark the permalink.